Confessions of a Single Parent Pessimist: LG Kizon Review: I Can Now Track My Toddler Wherever He Goes! 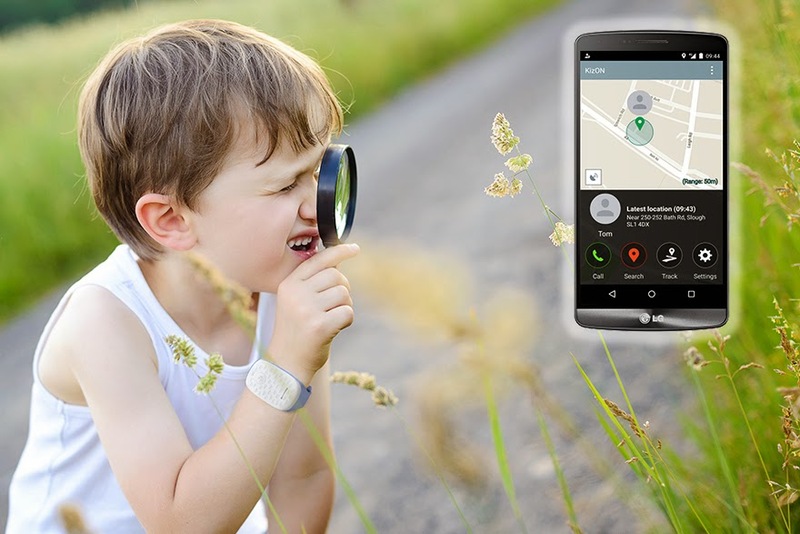 LG Kizon Review: I Can Now Track My Toddler Wherever He Goes! Chunk has been a very lucky boy this week as he got to try out the brand new LG KizON which is coming to the UK very soon! At the moment he is very into anything superhero-style and the KizON is a watch-shaped gadget he wears which enables him to call me or vice versa. He saw it as a superhero gadget and loved wearing the chunky blue watch and pressing it's magic button which made my phone sing. The KizON comes in blue or pink and is designed for children aged 3-9. The main aim of it is for parents or guardians to be able to contact their child or locate them when needed, and it also enables the child to contact them if they have any worries or emergencies. The device has a SIM card inside but from the information I have so far I cannot tell whether I would have to put money onto the SIM regularly and how much it would cost for him to call me. I'm also not sure if it would notify me when the credit was too low to make a call, so I would be interested to find this out. It's made from a non-toxic material which is appropriate for sensitive skin and it's very lightweight so Chunk was able to wear it for long periods of time without irritation. It has a special fastening that makes it difficult for young children to take off, to ensure it stays on when they are away from their parents which is great, even though I found it tough to fasten initially! It has a 36 hour battery and you can register two guardians on the device that the child can call. These guardians download the KizON app onto their android phones and they can locate the child using GPS and can find out how much battery life the device has at any one time. ﻿﻿What I love is that all he needs to do is press one button to call my phone and if for any reason I don't answer, the device then tries to call the second guardian. It also has a setting where I can specify which phone numbers can contact them (4 maximum), and any that are not on that list cannot contact him. Due to Chunk being only 3 years old, I was concerned that he would not be able to work out how to call me or answer the call, so we did a few tests by sitting in different rooms from each other and I noticed I could add the option for his device to automatically answer my call after 10 seconds if Chunk hadn't answered it himself. This worked well and meant I didn't have to worry about him not answering. It also meant I could listen to what was happening if I couldn't get hold of him as the phone stays on for one minute, so if he were to be hurt, I could shout down the phone and hope someone around him could hear! I could then use the tracking section of the app to find his location and contact emergency services if appropriate. GPS tracking means you can locate your child if they run off! Despite this, I think it will help to locate many children who get lost or go missing which could possibly reduce the amount of children who go missing or get abducted, which would be amazing. At the time of writing the price of the KizON was not disclosed or the date of when it will be launched in the UK, but I imagine we will not have long to wait! I was provided with the KizON to test for the purpose of this review. No payment was received and all opinions are honest and my own. My soon to be 3 year old could do with one of these as he is too independent for his own good. I think this looks like an absolutely awesome gadget. I'd feel a lot more confident taking my children to busier places by myself. Wow this is amazing. Brilliant idea and piece of equipment.